The Persian Water Wheel was ordered by the Falmouth Water Company and installed in 1798. It is a large vertically situated wheel with a diameter of six metres (20 feet). A dam was built to supply a flow of water. The wheel was equipped with radial blades or paddles that rotated the apparatus as they were impacted by the flowing water that came into contact with the lower immersed portion of the wheel. Curved, rectangular buckets were fitted around the outside circumference. As the machine rotated, the buckets filled with water, which was carried upward and spilled near the top of the wheel into a six metre (20 feet) high wooden trough. The water then flowed by gravity via a 15 centimetre (six-inch) iron pipe to Falmouth where it emptied itself into a reservoir. The buckets then returned empty to the bottom of the wheel to repeat the process. In 2008, Falmouth Heritage Renewal and students from the University of Virginia Falmouth Field School restored and reconstructed portions of the water wheel, which had fallen into a state of disrepair. During the process, the team used many of the original parts, and was also able to recreate the water wheel’s support system, catch basin, and cat walk. The team also discovered the 15 centimetre (six-inch) cast iron pipes that once carried the water to the reservoir in Water Square. Once restored, the water wheel began lifting its buckets and completing a full rotation every 30 seconds, delivering an estimated 1135.6 litres (300 gallons) of water per minute into the water system. Schurton, Robert. 1990. 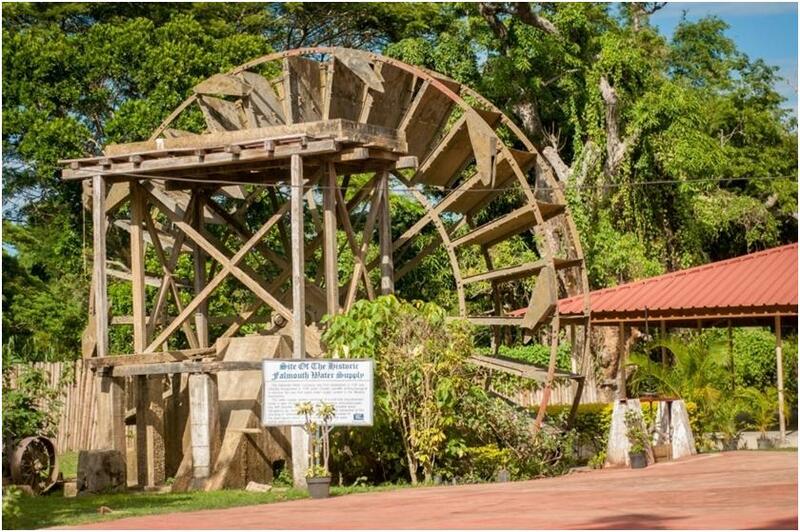 “The Persian Water Wheel” in The Sunday Gleaner, November 11.